I live in a small town in Southern Illinois. Just about everyone I know owns an ATV or side by side. I mean, how else are you supposed to get your mail? If you own any amount of property ATV’s are a valuable tool, many times are a necessity, not to mention they are a lot of fun. As an insurance agent I hear all the time from my clients and prospects that they don’t want to purchase a separate insurance policy for their ATV. Here are a few reason why I recommend purchasing separate insurance for your ATV. Homeowners Insurance won’t cover physical damage or theft. If your ATV is damaged or stolen it will not be covered under your homeowners policy. You need collision coverage to pay for repairs in case of an accident. You need comprehensive coverage in case the ATV is stolen, damaged by fire , vandalism, or extreme weather. If you buy an insurance policy for your ATV you can purchase comprehensive and collision insurance pay for physical damage or theft. So let’s say you have some friends over and you decide to take them for a ride on your side by side. You decide you are going to take them down the road to show them how fast it goes when all of a sudden you swerve to miss a branch and you throw your friend from the vehicle. They suffer multiple broken bones and have to take a helicopter to the nearest trauma center. This is going to be expensive, and that’s before your friend gets the best attorney in the area. They send you a letter that says “I’m not your friend any more, I want all of my bills paid and when you’re done with that go ahead and write me a check for whatever is left of your liability limit!! !” If you submit this claim to your homeowners insurance they are going to send you a letter that says “Your homeowners general liability does not extend off the described premises for your ATV. Sorry you lost a friend.” Purchasing an insurance policy for your ATV will cover you for on and off premises liability. Insulate your Homeowners Insurance from liability claims. So what if you are one of my clients that says you never take your ATV off premises? 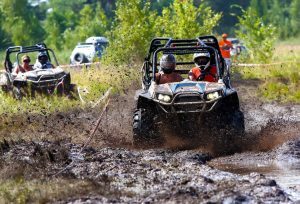 I would say that insuring your ATV liability on premises with your homeowners policy is most likely your biggest risk to your liability limits. It’s riskier than the Pitbull, the trampoline, and the swimming pool without a fence. If there is a severe injury like the one outlined in the previous section except it happens on your property you most likely will meet you homeowners liability limit. If you file a large liability claim on your homeowners insurance there is a good chance that your insurance will be non-renewed by your insurance carrier. If you are non-renewed and you have a large liability claim showing in your claims experience you are going to have a difficult time finding a different carrier to insure you, and if you find a willing carrier it is going to be expensive. You may very well end up insuring your home the Illinois FAIR plan or a similar program in a different state. The coverage will be expensive and limited. It makes sense to not put your homeowners liability limits at risk by purchasing a separate ATV policy. If there is a large claim it will be much easier and less expensive to find a new insurance policy for your ATV than it will be to replace your homeowners insurance. Between medical expenses and disability payments personal injury claims can get very expensive very fast. If you would consider letting your friends or extended family use your ATV you may want to consider carrying higher limits of liability. If you are working with an independent insurance agent you will most likely be surprised how affordable an umbrella policy can be. ATV’s can be a lot of fun and they can be a great tool around the farm as well. Under most circumstances assuming your ATV is adequately insured by your homeowners insurance is a recipe for disaster. You may be able to insure your ATV separately through the same insurance carrier that writes your home and auto insurance or you may find a standalone policy to have better coverage or to be more affordable. Either way separately insuring your ATV will always be a more effective way of protecting your ATV as well as your personal assets. If you are looking to insure your ATV give us a call Beacon Insurance Group (618)242-5411 or email us a quotes@beaconinsgroup.net. We would love to help you with all of your insurance needs. So I used to have a girlfriend that drove an hour to work every day in Chicago rush hour traffic in her 5 speed manual stick shift Saturn while eating a bowl of Cheerios. Wondering what kind of special person would do such a thing? Let me tell you she was really special, like so special I could write a series of bestselling psycho thriller novels special. But to answer the question, probably allot more people than you think. Distracted driving has become a problem of epidemic proportions in the United States. Chances are you have been guilty of checking your email, doing your makeup, or texting your buddy while you were driving. I mean you probably weren’t dumb enough to eat a bowl of Cheerios while driving your stick shift in rush hour traffic, but it doesn’t take something that egregious to cause a major accident or get you in serious trouble. April is Distracted Driving Awareness Month, let’s all make a commitment to keeping our eyes on the road. If you need more convincing here are some reasons why you should be driving distraction free. Effective July 1st 2019, Illinois has increased the fine for distracted driving to $75 and distracted driving will also be considered a moving violation. Why does the moving violation matter? First if you receive three moving violations in a twelve month period your driver’s license will most likely be suspended. Law enforcement officials have the right to pull you over just for showing signs of distracted driving. This includes swerving and looking down into your lap. If you have ever driven behind someone who is texting or facebooking while driving it is pretty easy to figure out what’s going on. Another reason moving violations matter is because they drastically increase the cost of your auto insurance. Not only do insurance companies look at how many moving violations you have, but they look at the type of moving violations as well. So if you have a moving violation for driving five miles an hour over the speed limit, typically I can convince an underwriter that it isn’t that big of a deal. Distracted Driving on the other hand is a huge concern for insurance companies right now. Many insurance companies view distracted driving to be as bad as driving under the influence and there is research to back that up. According to the National Highway Traffic Safety Administration at least 25% of all motor vehicle accidents involve distracted driving. Around 10% of all motor vehicle fatalities involve distracted driving. Those numbers have been moving in the wrong direction for the past 10 years. Federal and State Governments are taking action to get distracted driving under control and you can only expect penalties to become more severe. Pull over to a safe place to talk on the phone, text message, or email. Don’t touch that dial. Adjust seat positions, climate controls, sound systems, and other devices before you leave or when you stop. Don’t multi task while driving. Don’t use your mirrors for personal grooming. Pull over to care for your children. I started Beacon Insurance Group in 2012, and since that time I have had clients on the giving and receiving end of distracted driving. I have had a client cause a fatality because he was texting at night and rear ended a man ending his life. Besides the obvious pain and suffering he cause to this man’s family, and paying out his $500,000 limit of liability on his auto insurance, my client has to go through his life knowing what he did ended a human’s life. Another client of mine was riding his bike on a perfectly sunny day when he was hit by a girl playing on her phone. He is lucky to be alive, but suffered severe head and leg injuries. He spent months in the hospital, and two years later still isn’t fully recovered. So the bottom line is distracted driving just isn’t worth it. The fines and penalties or only going to increase with time. I know I the age of technology it is so tempting to pick up the phone to check a score or an email. You can never take back injuring or killing another human. At this point we all need to be aware that it is senseless to continue this behavior. So in honor of Distracted Driving Awareness Month let’s put down the phone’s….or bowls of Cheerios, and pay attention to the road. Another reason moving violations matter is because they drastically increase the cost of your auto insurance. Not only do insurance companies look at how many moving violations you have, but they look at the type of moving violations as well. So if you have a moving violation for driving five miles an hour over the speed limit, typically I can convince an underwriter that it isn’t that big of a deal. Distracted Driving on the other hand is a huge concern right for insurance companies right now. Many insurance companies view distracted driving to be as bad as driving under the influence and there is research to back that up. According to the National Highway Traffic Safety Administration at least 25% of all motor vehicle accidents involve distracted driving. Around 10% of all motor vehicle fatalities involve distracted driving. Those numbers have moving in the wrong direction for the past 10 years. Federal and State Governments are taking action to get distracted driving under control and you can only expect penalties to become more severe. I started Beacon Insurance Group in 2012, and since that time I have had clients on the giving and receiving end of distracted driving. I have had a client cause a fatality because he was texting at night and rear ended a man ending a man. Besides the obvious pain and suffering he cause to this man’s family, and paying out his $500,000 limit of liability on his auto insurance, my client has to go through his life knowing what he did ended a human’s life. Another client of mine was riding his bike on a perfectly sunny day when he was hit by a girl playing on her phone. He is lucky to be alive, but suffered severe head and leg injuries. He spent months in the hospital, and two years later still isn’t fully recovered. So the bottom line is distracted driving just isn’t worth it. The fines and penalties or only going to increase with time. I know in the age of technology it is so tempting to pick up the phone to check a score or an email. You can never take back injuring or killing another human. At this point we all need to be aware that it is senseless to continue this behavior. So in honor of Distracted Driving Awareness Month let’s put down the phone’s….or bowls of Cheerios, and pay attention to the road. Transitioning into assisted living or nursing home care can be a very stressful process for a family. Typically, the family members making the transition have come to the realization that they are no longer able to safely live independently due to physical and sometimes mental limitations. There is a lot to think about when making this big of a decision. One issue to deal with is what to do with the home. Do you sell the house? Are the loved ones making the transition willing to sell the home? Whether you choose to sell the home or keep it, something that is often overlooked is that most homeowner policies drastically limit coverage, or even cease to offer it altogether once a home has been vacant for a specified period of time. The reality is that vacant homes are more prone to be damaged by vandalism, arson, thief copper, water damage, fire, and other types of damages. When it comes to liability, vacant properties are more likely to be a nuisance. It is not uncommon for trespassers to claim they were injured on a vacant property and for them to seek damages. Typically, after a period of 30 to 60 days homeowner’s policies will cease to cover your property from any cause of loss leaving your home completely uncovered. So, if your homeowners policy is not intended to cover your vacant property what can you do about it? Speak with your insurance agent to find out the amount of time you have until your homeowner’s policies vacancy clause kicks in. There is no need to change anything until you have to as covering a vacant home is most likely going to be more expensive. Ask the insurance company to issue a Vacancy Permit Endorsement. Not all insurance companies are willing to offer this endorsement, but many times for a specified period of time your insurance company will grant coverage on the vacant dwelling. This endorsement will most likely have the same exclusions as a vacant home policy such as vandalism and glass breakage, but it will also most likely be more affordable than obtaining vacant home policy. If your insurance company is not willing to offer you a Vacancy Permit, you will need to obtain a Vacant Home Policy. There are a number of carriers that offer vacant home policies. They will most likely exclude vandalism and glass breakage. It is important that you review the coverage and compare different vacant home policies as the coverage varies drastically. For example, one carrier we work with for vacant homes will only off Actual Cash Value on your home if you have filed a claim in the past three years, where another carrier we work with will offer full replacement cost. You will also want to purchase a renters insurance policy to cover your property and liability at the nursing home or assisted living center. Renters insurance is very affordable and there should be no shortage of carriers willing to offer this coverage. What if you decide to make the house into a rental property? Although this isn’t a big deal you will need to obtain the proper insurance as a homeowners policy is inadequate. You will need to obtain an insurance policy designed for a rental dwelling that not only sufficiently covers the property, but provides coverage for you as a landlord. 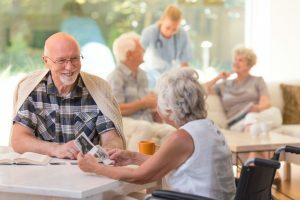 There are also other things to consider when transitioning to Assisted Living or a Nursing home. What if one spouse is permanently transitioning and the other spouse is staying home? Ask your insurance agent to offer an Assisted Living Care Endorsement on your Homeowners Policy. If the company refuses, simply find one that will accommodate you. The Assisted Living Care Endorsement will cover the personal Property and provide liability coverage to a specified relative and a specified location of residence. It also should give you coverage for items like glasses, hearing aids, contact lenses, false teeth or dentures, medi-alert devices, walking aids such as walkers or cane, and wheelchairs. You can get similar coverage by obtaining a renters insurance policy, but many times the Assisted Living Care Endorsement is a more affordable option. Transitioning your loved ones into assisted living or skilled nursing facilities can be a very stressful time. The last thing anyone needs is to find out that 70 days after they moved out that a fire or busted pipes isn’t covered on your vacant dwelling. Give us a call at Beacon Insurance Group, we have access to over twenty insurance carriers and we will find the best option for your home and possession when you move to assisted living. So what exactly happened here? My agent was in the process of obtaining life insurance for two business owners that were partners in business. The life insurance was intended to fund a buy-sell agreement. Due to the size of these policies and what they were intended for the life insurance company was asking for financial statements and other business information. During this process we got an email from one of the partners with an attachment that stated “Important Business Information Please Open Immediately”. My agent opened the email and the attachment was empty, or so he thought it was empty. What perfect timing, we were expecting important information from a client and we get an email from him telling us he has important business information, expect it was a hacker and now our system has been exposed. When my agent clicked on the attachment it allowed the hackers to access our email system and allowed them to send the exact same email to our clients. So what does a business owner do in a situation like this? Do you ignore it and hope nothing comes of it? Do you send an email out to your customers stating “I’VE BEEN HACKED DON’T OPEN MY EMAILS!!! !”- And then hope nothing comes of it? Or were you smart enough to purchase a Cyber Liability Insurance Policy? Luckily for me I had the last option available. All I had to do was call the 1-800 number on the first page of my insurance policy and tell them what happened. Within the hour I received a phone call from a law firm that specializes in Cyber Liability. They were able to guide me through the process of what needed to be done to legally navigate this issue. I also was put in touch with a firm that handles the forensics and IT issues associated with hacking. They were able to quickly get into my system, find out what happened, and identify what information was exposed. At the end of the day roughly 360 individuals names and Drivers Licenses were exposed, and an additional 20 Individuals with Social Security Numbers were exposed, one of them being my largest and wealthiest clients. Over the next month we worked together with the law firm to properly notify everyone involved, to comply with all state regulations, and to provide credit monitoring for a year for everyone whose information was exposed. Our policy also would have covered us for defense cost and any damages to those individuals had their information been used. Luckily that didn’t happen. This all sounds like a lot work doesn’t it? Well I dialed a 1-800 number and all of that work was done for me besides me spending probably an hour or two of my time on conference calls getting updated on what was going on. I paid a $2,500 deductible. When it was all said and done my claim exceeded $67,000! This is just one example of what could happen, and the hackers are ahead of the game. How about coming to work to find all of your computers locked with a message on your screen “follow these directions to procure $2,000 of bitcoin, wire it to this foreign bank, and we will turn your computers back on”? Wow, I’ve always wanted to learn how to mine bitcoin!!!! Would you like some guidance in a matter like this? The feeling of finding out you have been hacked without a cyber policy is probably similar to watching your uninsured building burn, except your local fire department can extinguish a fire. Don’t bother calling your local attorney or IT professional, they most likely won’t know what to do. Every business that uses computers needs to be protected by a Cyber Liability Insurance Policy. Over the past few years as the insurance industry has gathered more data on claims and has a better understanding of the risks that are out there. The costs of these policies has come down dramatically and companies have tailored their coverage to fit specific industries. At Beacon Insurance Group we are able to provide tailored coverage for you specific industry at very competitive prices. Most of the time we are able to provide instant quotes from multiple carriers by answering five simple questions. A business operating in the 21st century simply cannot afford to not have a Cyber Liability Insurance program. I was recently asked this question by one of our Beacon Insurance Group clients, and thought I would share the answer here for our readers. At the end of the day, there’s not much we can do about it though. Insurance companies have been using credit in their rates for decades, and that’s not likely to change. By the way, insurance companies don’t pull your credit like a mortgage company or credit card company does. There is no negative impact on your credit as a result of an insurance company looking at it. When I say “pull” what I mean is that the insurance company is doing what’s called a soft inquiry, which is not the same thing as having your credit pulled (hard inquiry). When does credit play a role in insurance rates? It’s important to understand that insurance companies don’t continuously check or monitor your credit. Usually, they only check it when you first get a quote and/or sign up with them in the very beginning. This means that if your credit score increases (or decreases) your insurance company does not automatically know about it. So, to my customers question of whether or not his increased credit score will lower his rates, the answer is not automatically. What has to be done on our side as the agent is contact the carrier the insurance and ask them to do what’s commonly referred to as a “re-score”. This is when the insurance company can re-run the person’s credit (soft inquiry) to see if there is any positive bearing on the rate. This isn’t something that the insurance company is going to let the agency do every single year, so it’s not worth even asking unless there has been a significant change in your credit score, and only you as the customer would know if that was the case. If you’d like to get a better handle on your credit rating, it could be helpful to setup credit monitoring. We hope this was helpful! As always, leave us comment below if you have any questions. Why do my auto insurance rates keep going up even though my car is getting older? At Beacon Insurance Group, many of our clients ask this question so I would like to address it from a couple of angles.